Athletics are in Heather Lyke’s DNA. She never turned down the chance to play any sport while she was growing up. But it took two degrees — one in education, the other in law — for her to decide it was the athletic world she should remain in. 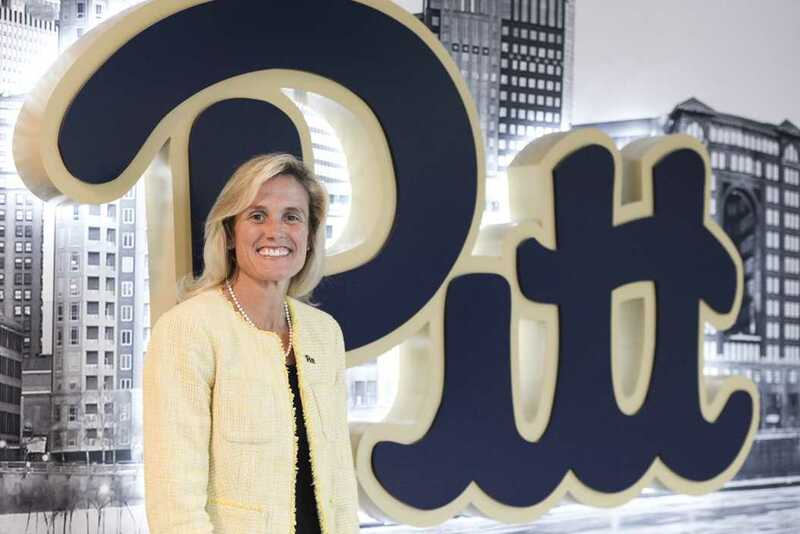 Lyke is Pitt’s newest athletic director — the first female AD in Pitt’s history, a feat she also achieved when she joined Eastern Michigan’s team in 2013. Her excitement for this opportunity and enthusiasm for athletics is something she almost wills into the people she works with. Her family is also excited to enter Pittsburgh’s atmosphere. When Pitt’s new AD is off the clock, she is spending time being active outside with her husband and three children. Ever the athlete, Lyke tries to make sure she does a couple triathlons as well. After spending much of their time in the Midwest, she says her family is ready for the city life and everything it has to offer, in terms of culture and, of course, athletics. Since she was a child, Lyke was constantly active. She played “everything” she could, and this drive carried over into her collegiate years too. While attending the University of Michigan, Lyke played first base for the Wolverines softball team. Her aggressive commitment even pushed her to play through a broken collarbone. She was captain for two years and was a member of the 1992 Big Ten championship squad. She never neglected the academic side of being a student-athlete and graduated with a bachelor’s degree in education. From there she went on to the University of Akron School of Law and earned a juris doctorate. So, Lyke decided to dive back into athletics. She began by interning at the Enforcement and Student-Athlete Reinstatement department of the NCAA from 1995-96. She then moved on to Cincinnati as the assistant athletic director for compliance. After Cincinnati, Lyke worked at Ohio State University until 2013, taking on many roles over her 15-year stint. She was a member of the athletic department’s executive team, managed 10 of the 36 athletic programs, oversaw the sport performance division and developed “Bucks Go Pro” — the university’s student-athlete internship program. She also became a softball analyst for the Big Ten Network in 2009, a position she held until 2013. Even in her position as AD, Lyke said many of the skills from her on-camera job have transferred to the media relations side of her current job. Lyke’s most recent job — prior to arriving at Pitt — was as Eastern Michigan’s AD. While there, she focused on turning around the school’s athletics programs and making them something exciting for the community. She brings this same excitement to any challenges she might face while at Pitt. The building starts with learning. Lyke’s background in education might give her that edge in fostering a department that continues to push itself. In order to create such an outstanding experience for the University’s athletes, Lyke recognizes how she must become familiar with the intricacies of Pitt. This includes getting to know the needs of each of Pitt’s 19 teams. Lyke won’t only be interacting with the student-athletes and coaches, though. Part of her job, and something she aims to do, is get the surrounding community as excited about Pitt athletics as she is. Lyke has laid out the welcome mat herself to begin developing Pitt’s “culture of excellence” in regards to athletics. Christian Spears — Lyke’s recent hire for deputy AD and a man who spent three years with her at EMU — is no stranger to Lyke’s drive and knows what she is capable of accomplishing. Hiring Spears gives her the chance to be a step ahead in terms of getting to know who she will be working with. “The fact that we’ve worked together for three years at another institution, and we can now bring that collaborative relationship to Pitt, we think will allow Pitt to grow faster in terms of the things that we do to help our coaches and student-athletes be as successful as they can be,” Spears said. Spears will mostly be in charge of revenue generation, but will work closely with Lyke to build Pitt’s athletic program. Both are determined to make it a source of pride for Pittsburgh.